The EXOMARS 2016 EDM mission objective was to reach Mars during the statistical dust storm season. DREAMS experiment had the unique chance to make scientific measurements with which it is possible to characterize the Martian environment in this dust loaded scenario. 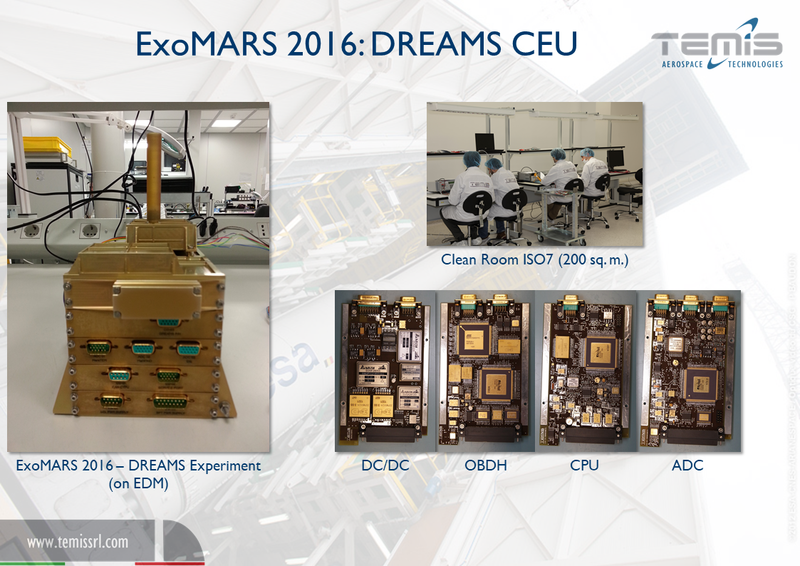 In the frame of EXOMARS 2016 Mission, TEMIS and CISAS have developed a CEU subsystem for DREAMS payload that is housed on Entry and Descent Module (EDM) and accomplished the role of data handling platform of the DREAMS payload. DREAMS is a suite of six sensors for meteorological and electric field investigation on the surface of Mars. It is an autonomous system and it includes its own battery for power supply.